Understand the process of fundraising from identifying a project to nurturing a funder. Identify the unique selling properties (USPs) of their organisation. Know how to get supporting evidence for their application. 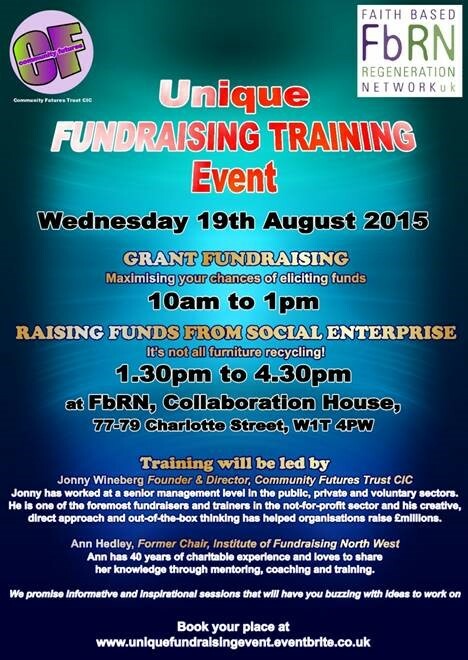 Be aware of a range of fundraising opportunities in addition to grants. Through our links with the Faith-based Regeneration Network, LBFN members are kindly offered a 40% discount, so book through this link, which includes the discount http://www.eventbrite.co.uk/e/unique-fundraising-training-event-tickets-18005137852?discount=40OFF. If you need to fill in a promotional code, enter “40OFF”. The workshops will take place at LBFN’s shared offices at Collaboration House, 77-79 Charlotte Street, W1T 4PW (Goodge St tube). This entry was posted in "How to" (ideas guides training), Camden, Funding by Catriona Robertson. Bookmark the permalink.